Our inspiration is part of our history. Insuring your pet care business shouldn’t come at a high cost. Since 2006, we have been dedicated to offering the best customized insurance for Canadian pet care professionals at an affordable price. We would love for you to find out first-hand how dedicated we are to offering you a customized coverage plan for your business. Our track record is proven, and our legacy lies in our reputation amongst our customers. Our commitment doesn’t stop there as we also offer exceptional claims support for Canadian pet care professionals like you. At PROfur, we pride ourselves on our unique product. Customize your policy according to your business’ size, coverage required, and the services you provide. Make changes to your policy with our team at any time. We can help customize your policy as your business grows and changes. We only charge if a change has an impact on your insurance risk. We don’t charge for simple administration amendments. Pet Coverage plus professional and general liability insurance to cover the loss, death or accidental injury of pets, such as cuts, allergic reactions, broken bones and dog bites. Designed to cover emergency veterinarian expenses or if you’re sued. To help cover the cost of posting a reward and the expenses to recover a runaway pet. General liability insurance to protect against accidental injury to your clients, such as dog bites, slips, trips and falls. To protect your business contents, including tools and equipment, plus stock and renovations, if any, from fire, theft, storm damage and more. To cover lost profit and ongoing expenses if your business is interrupted due to a claim. To reimburse a customer if an employee or independent contractor working for you steals from your customer while in their home, such as while pet sitting or dog walking. Back in 2006, Keith Ingoe was the President of HS Financial Services. He was a devoted dog owner. During that time, Keith would regularly and faithfully take his dog Cinder to his local groomer. One day, while waiting on Cinder, Keith, a strong supporter of small businesses, engaged in a conversation with the owner about her business. What he learned that day was the owner found it extremely challenging to find affordable, customized insurance for her type of business and all the services she provided. Having been in the insurance industry for over 30 years, Keith recognized a gap and need in the market. When he returned to his office, he decided to discuss this with his son Chris and a short time later, the PROfur program was born. In 2011, a few years after Keith’s “retirement” (and for those of you who may have met Keith, you’ll understand the need for the quotation marks), Chris decided to focus on servicing niche markets, and so HS Financial was sold, and Chris and PROfur’s original program manager, Jennifer Houston, moved PROfur to its new home at KRS Insurance Brokers. Chris has been committed to maintaining the high level of service and support his family’s reputation demands, and Jennifer shares that commitment. Together, they are responsible for the PROfur team, and to supporting our clients. And if you’re lucky enough to call at the right time, you’ll even find Keith there lending a hand during his “retirement”! 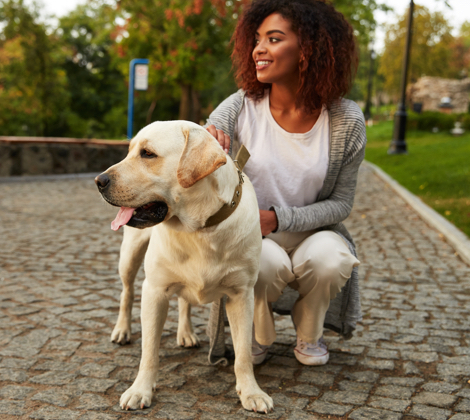 Throughout the years the program grew and in 2012 the policy coverages expanded to include dog trainers, dog walkers, pet sitters, pet daycares, boarding and pet therapy services. Chris and Keith continued their mission to provide the best value policy in the market and a few short years later their specialized protection for pet care professionals increased again to include pet first aid trainers, demo training dogs and enhanced coverage for runaway pets. Additionally, the company increased base coverage for customers pets giving them the option of higher limits to help cover the costly emergency vet expenses should any unfortunate accident or illness occur. Profur announced greater coverage for runaway pets with increased coverage limit. Today, PROfur® continues to work with only pet-based business and remains committed more than ever to offer specialized insurance for pet care professionals. With over a decade of knowledge and experience, their goal is, and has always been, to provide a superior product at an affordable price so that their clients and the pets in their care are protected. Profur announcd greater coverage for runaway pets with increased coverage limit.